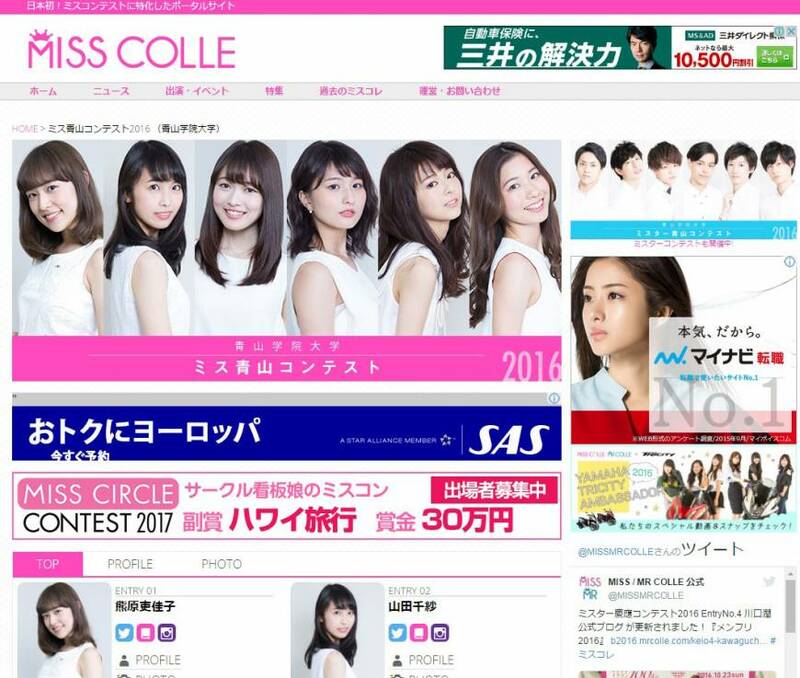 A screenshot from the Miss Colle web portal for university beauty contests shows plenty of ads from corporate sponsors. On Oct. 4, Keio University in Tokyo announced that a student group responsible for organizing its annual beauty pageant had been ordered to disband for conducting “dangerous acts,” including forcing minors to drink. The announcement was soon followed by news that male members of the group, called the Keio Advertisement Society, gang-raped a female student, although the elite private school later said it was unable to confirm the allegation. The disbanding of the group caused the Miss Keio Contest, known as one of the most flamboyant university beauty pageants in the country, to be called off this year — and likely for years to come. What’s all the fuss about university beauty pageants? The Japan Times takes a closer look at how the tradition developed in Japan. What do campus beauty contests mean to students? For the students, a beauty pageant is a way to show the world what they are capable of, said Kyohei Matsumoto, 22, of Aoyama Gakuin University in Tokyo. 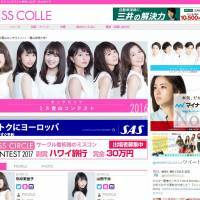 Matsumoto heads a group of Aoyama Gakuin students who are organizing the annual Miss Aoyama contest, which it says is Japan’s oldest university beauty pageant. The first Miss Aoyama contest was organized in 1977, Matsumoto said. “The good thing about the contest is that everything is organized by students from scratch, from where to hold the event to what to do at the contest and how to promote it,” Matsumoto said. For female nominees, being named a candidate is a huge plus for those who dream of working as TV broadcasters because they become campus celebrities. Winning is considered a significant stepping stone to entering such a highly coveted career. Several TV announcers have taken this route: 1996 runner-up Miss Aoyama Christel Takigawa became a freelance anchorwoman, and 1999 Miss Keio Minako Nakano and 2011 Miss Sophia University Reina Uchida have become news announcers at Fuji TV. Matsumoto believes the schools view beauty contests as publicity tools that can be used to attract more prospective students. About 200 universities hold them. When are the contests held and what are the criteria? Although procedures vary from place to place, beauty contests are often billed as the main event of a university’s autumn festival. About three to 10 nominees are selected, with the winner decided by both online and physical voting at the contest site. They are also usually open to the public, meaning nonstudents can vote as well. Candidates are judged by appearance, personality, skills, stage performances and social media presence. Some universities hold a male pageant in conjunction with the female one. Others hold contests for men who dress like women, and vice versa. One school, Tokyo Institute of Technology, where nearly 90 percent of the undergraduates are male, holds an annual Mr. Beauty contest to recognize the most beautiful cross-dresser. Why do the pageants have such a high profile? University beauty pageants have become increasingly important to big business. For some companies, university beauty pageants are considered as an effective way to promote products to students, who have become a difficult demographic to reach because they watch less TV, said Masaya Hasegawa of You Can Pass Co., an advertising agency specializing in marketing to students. Companies, especially cosmetics makers, apparel companies and waxing salons, sign up to sponsor pageants at major universities. They provide products to the nominees for free while asking them to spread positive messages about them on social media in return. For instance, one of this year’s candidates for the Miss Aoyama contest has about 10,000 followers on Twitter. “Young people know that TV celebrities are out of their reach. … They know that beautiful celebrities are not using the shampoo they are advertising,” Hasegawa said. But if that same product is promoted by a student, the message becomes more appealing, he said. Other firms offer eye-popping prizes to the nominees just to create a buzz online, Hasegawa said. For example, some of the companies that sponsored the Miss Aoyama contest in 2015 gave away trips to Hawaii or parcels of land to the finalists. Another offered to give a nominee a job. While praising commercial support, Matsumoto of Aoyama Gakuin pointed to the risk of the pageants being hijacked. Does everyone support the contests? No. Like other beauty pageants, critics say they’re sexist. In 2011, a plan to launch a beauty pageant at International Christian University in western Tokyo was scrapped after drawing the ire of students, alumni and others opposed to the idea. “We stand against beauty pageants because they have a history of reinforcing a unitary concept of ‘women’s beauty,’ which is highly racialized, somatically normative, and classed, as well as a history of functioning as a tool for sexual objectification of women,” a group opposed to the event said in a statement written in English. Some universities, like Meiji University in Tokyo, organize the contests like a fashion show instead of a beauty contest. Others, like elite Waseda University, don’t allow students to hold official beauty contests in its name.